The Miocene site of Stetten near Vienna inherits the largest palaeontological oyster reef known today. Over 650 different species had been found and the excellent conservation of their remains allows a precise reconstruction of the environment and its inhabitants. In addition to a 3D reconstruction, carried out in 2014, a mobile museum guide was produced in 2017, showcasing the sites history with animated 360° scenes in an immersive stereo vision. About 17 million years ago the Korneuburg basin near Vienna, Austria, was part of an elongated estuary with a tropic ocean extending into it. Swamps, small islands, muddy coasts and dense tropic forests provided ideal conditions for animals and plants. The finds of the fossils in the Korneuburg basin allowed the geoscientists to reconstruct the different living environments. documentation of the findings. After years of preparatory work, the final excavation works on the oyster reef started in spring 2008. Approximately 20 years later the complete oyster reef was excavated in course of the biggest palaeontological excavation that ever took place in Austria, where 20 geoscientists, 200 volunteers, excavated the site in 15.000 hours. The theme park, which was opened in 2009, does not only show this unique natural monument, but also explains the history of the ocean that once dominated the area and its habitants in several different stops. In 2014 the Theme Park “Fossilien Welt” contracted us for the creation of a large scaled projection of approximately 400 m², covering the complete oyster reef, showcasing the reconstructed environment together with its inhabitants. The visitors can view this animated projection, telling the story of its genesis until its decline from an elevated position above the excavated fossils. The production of this animated sequence included the reconstruction of approx. 50 km² of the three -dimensional palaeontological terrain together with 46 animated animal and plant species. palaeontological fauna and flora including new visual components like augmented reality in a stereo vision. Here we could take advantage of re -use of contents from the former productions, thus updating this content with new scientific perceptions. Throughout the entire site, 19 interactive stations are available, explaining their respective features through augmented 360° scenes. In order to access this content, the visitor can download the appropriate application either through the internet (before the actual site visit) or directly at the sites visitor’s centre. By purchasing the entrance fee, the user can unlock the full application and optionally use a lightweight VR Headset which can be easily mounted to his smartphone, giving him the opportunity to see the content in an immersive 3D vision. 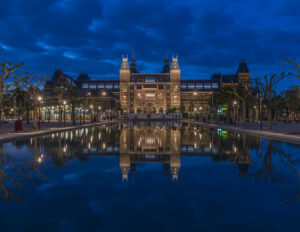 The functions of the virtual museum guide include a general introduction to the site and the morphology of the landscape in the past 17 million years, followed by 19 animated scenes which are triggered through optical targets at the appropriate stations of the museum and its surrounding park. This application allows the user to extend the given information on site deepening his understanding of many complex geological and palaeontological features. The production of the application was accompanied by a continuous testing and debugging process including the usability for a broad range of hardware devices. In addition, a query was undertaken by the university of economics in Vienna, to monitor the user’s behaviour in order to optimise the applications function. The general feedback showed that users of all ages enjoyed the immersive experience and the given information’s presented in a ludic way. A periodic software update together with additional content will assure the applications activeness and its optimal function for the future.